Commonly called the Autumn Crocus, Colchicum autumnale is not a crocus at all, however it does look a little similar. The flowers appear in autumn on bare stems, flower colour varies with C. autumnale alba being a white form, the species itself is pale pink. 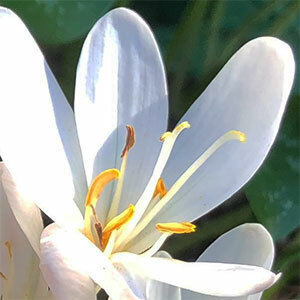 Once established this is a very easy care bulb if grown in good soil. Plant in a rich well drained soil in a sunny position. Prepare the soil well by digging in lots aged compost and some cow manure. Easy by division of established clumps in winter. Also possible from seed. Soil – Humus rich moist but not wet soil. Flowers – White or pink.